Demme Learning is a family-owned and operated business based out of Lancaster, PA (my home town) and has been providing homeschoolers, parents and small group learning environments innovative learning solutions since 1990. You may be familiar with their popular math curriculum, Math-U-See? Well they have done it again, but this time they are branching out and bringing families a unique spelling curriculum, Spelling You See! Each of the Demme Learning family of products encompasses their primary foundational principle which is involvement of an engaged parent! For the past several weeks Gwyn my 8 year old daughter has been utilizing Spelling You See: Jack and Jill (Level B). There are currently 5 levels of Spelling You See (two more levels F & G will be coming out in the Fall) and each one is based on one of the five developmental stages of spelling. Did you know there were 5 stages of spelling? I didn't! The 5 stages are Preliterate, Phonetic, Skill Development, Word Extension and Derivational Constancy. The instructors handbook will explain these 5 stages in more depth. There are no grade levels on the materials so your child will simply start at the appropriate developmental stage and move at their own pace. If you need help figuring out which level to start your child in Spelling You See has a placement guide on their website. After taking a look at the placement guide and samples I decided Spelling You See: Jack and Jill (Level B) would be a good starting point for Gwyn. Jack and Jill is for children who are moving from the phonetic stage of development to the skill building stage. It is the perfect choice for developing readers who print easily with lowercase letters and who know most letter sounds, including long and short vowels. I probably could have started her with Level C, but because Gwyn lacks confidence with reading and spelling I thought Level B would be the better choice. And I was right! Gwyn was thrilled that she could read the nursery rhymes and complete the worksheets with very little assistance. Level B is comprised of 36 lessons divided into two books (for ease of use). Each lesson is divided into five parts, A through E. One daily lesson consists of two facing pages and takes about 10-15 to complete. Gwyn enjoyed the lessons so much though that she would often do more than one lesson per day. The books are in full color and have simple illustrations on each page that go along with the nursery rhyme. You will only need a few simple materials to complete the daily lessons these include a pencil and colored pencils (each student pack comes with erasable colored pencils) or highlighters. In Jack and Jill book 1 each lesson follows the same pattern for the most part, so children know what to expect each day/week. I love consistency! For each daily lesson they will first read through the nursery rhyme with the parent a couple times. Then they will find different details within the rhyme, such as common patterns, punctuation, capitalization etc. Next they will copy a short phrase or sentence, trace and write several letters and finally fill in a set of letter boxes (focusing on short vowel sounds) to complete words from individual sounds. In later lessons the tracing and writing of letters ceases. And that is it short, simple yet effective! We have not made it to book 2 yet, but in book 2 children will continue learning nursery rhymes and will begin to look for vowel and consonant patterns in each passage. Children will also have extended copywork and they will find and mark patterns in their own work and compare it to the passage. Once a week children will also have fun with "No Rule Day," where they can freely write, dictate or illustrate a response to the weekly nursery rhyme. Student workbooks and the instructor's handbook are sold separately. There are simple instructions in the student workbook, but if you want complete information on how to best utilize the homeschool spelling curriculum I highly recommend purchasing the instructor handbook. In the first section of the handbook you will learn about the philosophy behind Spelling You See, the 5 developmental stages of spelling and the curriculum sequence and placement guidelines. Next you get an overview of the 36 lessons in the "Getting Started" guide. This section will explain how Level B is organized and what important skills and concepts will be learned. Next each lesson will be broken down for the instructor, don't worry there are only 2-5 bulleted items for each lesson! In the back of the handbook there is information on letter chunking, "no rule day," dictations, answers to frequently asked questions and a collection of helpful resources (like passages for dictation, daily word lists, general word lists and answer keys). 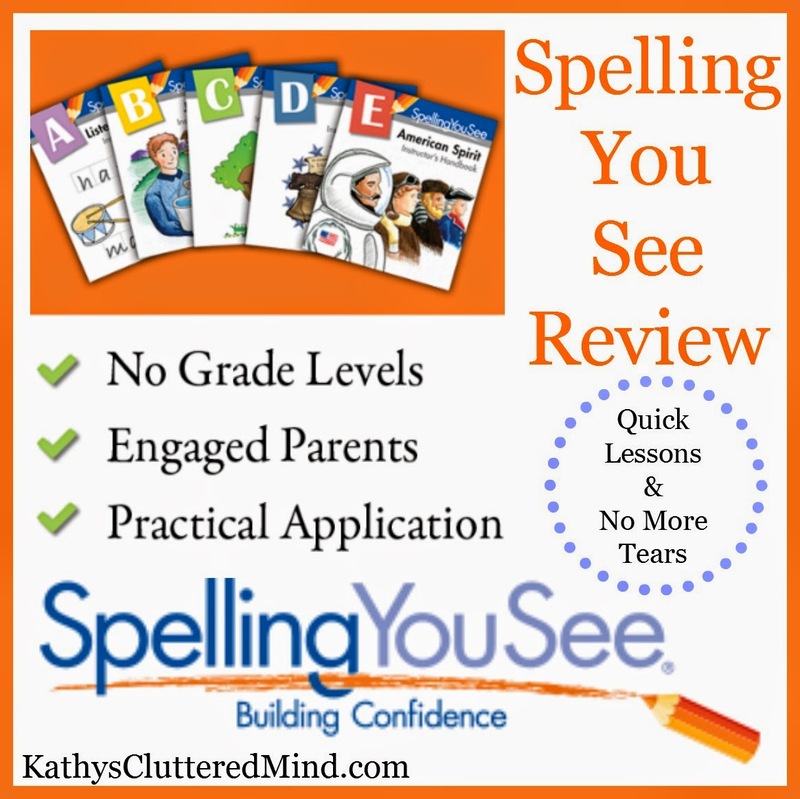 Spelling You See is a terrific program for all learning styles. Not only does Spelling You See teach spelling, but it also helps improve writing, speaking, reading and grammar! We like that the lessons are short, seriously 10-15 minutes and that is it. And we love that it teaches spelling using meaningful context, WITHOUT spelling lists and WITHOUT learning rule after rule! Spelling You See has definitely helped Gwyn build her confidence with reading and spelling over the last several weeks and it is a program that we will continue to utilize. Gwyn, "I like the short worksheets. They are fun and easy. I like the nursery rhymes too. I can even do the workbook in the car." Click here for more Spelling You See reviews from the The Schoolhouse Review Crew.